This post is thanks to KermMartian, who was visiting Geekboy1011 over the weekend to work on a few projects and caught onto the fact that I was working on this project. So he said "You should go post about it" and here we are. 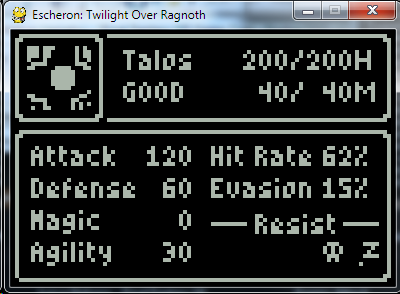 Internally, I'm calling this "Pyscheron" because it's Escheron: Twilight over Ragnoth coded in Python. The original project got pretty far until I cutscene coding needed to be done, and I found the compile times for simple testing became increasingly unacceptable. So a rewrite hell happened and I lost a bit of steam at around the time I was re-implementing the battle engine. Then the project sat for a while. Some time after that, Geekboy1011 jokingly asked "Escheron when?" and I turned that thought over in my head. I then pitched the idea of reworking it in C for the CE, but he vetoed that idea and told me that doing it in Python would be better. Why not? Most of the data import code was already written in my failed attempt to write a cutscene editor. Surely with a few tweaks, I could make it work. 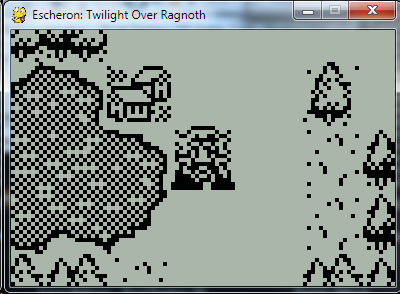 * Data import for Ragnoth Village and one point on the overworld's loading zones. For testing. * Need to finish up all actions possible from the main menu, including saving. * Did I forget anything? Maybe. Probably. Most likely. Oh who am I kidding? I probably forgot everything. A couple of screenshots showing progress with the menus. I remember seeing this project and thinking it was a shame it never got finished. 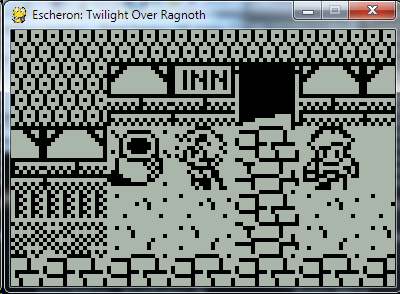 This version looks pretty good so far- I especially love that you kept the monochrome graphics. Keep up the great work! Pretty awesome, but you're saying that now we won't be able to play this on a calc . Thanks for posting this, Iambian! 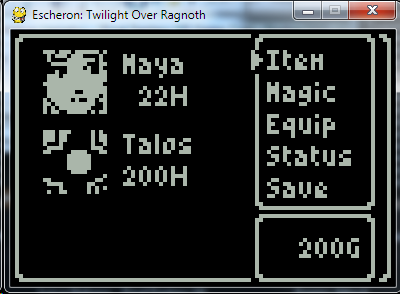 I remain ever saddened that despite how far it got, Escheron for the calculators never made it to release. You answered a question that I asked Geekboy1011 as well: why not write it in C, so that it could also be ported to the CE, so thanks for that. Finally, I'm glad to see how this is going, and I look forward to updates. My fingers are crossed that this will be the version of Escheron that I finally get to play in full. Most of the reason why Escheron didn't complete was due to how stupendously laborious and time-consuming it was to craft cutscenes and scenarios. Doing this project in Python may allow us to port the results of compiling these scenarios back to the calculator, since the remainder of the game was usable as it was. * All main and sub menus were added. * Title screen menu added. * Game data and settings loading and saving added. * Added in typewriter effect for game dialogs. About the typewriter thing. I needed to keep the event loop going and I didn't want my menu/text classes to do things that it really ought not be doing. So it became a wonderful adventure in trying to abuse generators to do non-generator-y things where I stumbled upon the magic of coroutines as implemented using yield as an expression instead of a statement. That was a bit of a learning experience and stuff like this is why I love Python so much. Image shows the title menu, adjusting graphics options to reduce size of window, continuing from a previously saved game, and demonstrating the function of various vehicles. In hindsight, I probably should've demonstrated more stuff. * Fill out all of the world's loading zones and test those. I then pitched the idea of reworking it in C for the CE, but he vetoed that idea and told me that doing it in Python would be better. What a stupid choice that was. Although I am liking the nifty screenshots and gameplay Looks like it will be pretty neat! There are 205 users online: 5 members and 200 guests. Members: calclover2514, GregsAStar, Jeffitus, LogicalJoe. © Copyright 2000-2019 Cemetech & Christopher Mitchell :: Page Execution Time: 0.357434 seconds.